Apple Cider Vinegar (ACV) is one of nature’s most effective all-natural skin products because of it’s plethora of benefits. It works on dry skin types just as well as oily and acneic, although it really is best for problem skin. ACV has a PH balance of 3 – healthy perfectly, PH-balanced skin is around 5.5, although most of us suffer from insufficient PH levels, which is why we dry, crack, break out AND wrinkle. (Take the skin PH test here). Basically, ACV, when used daily, can help restore the skin’s PH levels. ACV is also a natural source of alpha hydroxy acids which exfoliate dead skin faster and more efficiently. My love of ACV has to do with its ability to really clean out the pores, improve scaring and lighten sun damage. It’s kind of like an all-in-one for freaked out skin. Here’s the trick: Make sure you purchase raw, unpasteurized, unfiltered ACV with the “mother.” The “mother” is the stringy, slimy enzymes that look like sperm at the bottom of the bottle. They’re the active ingredient that make ACV such a potent toner. 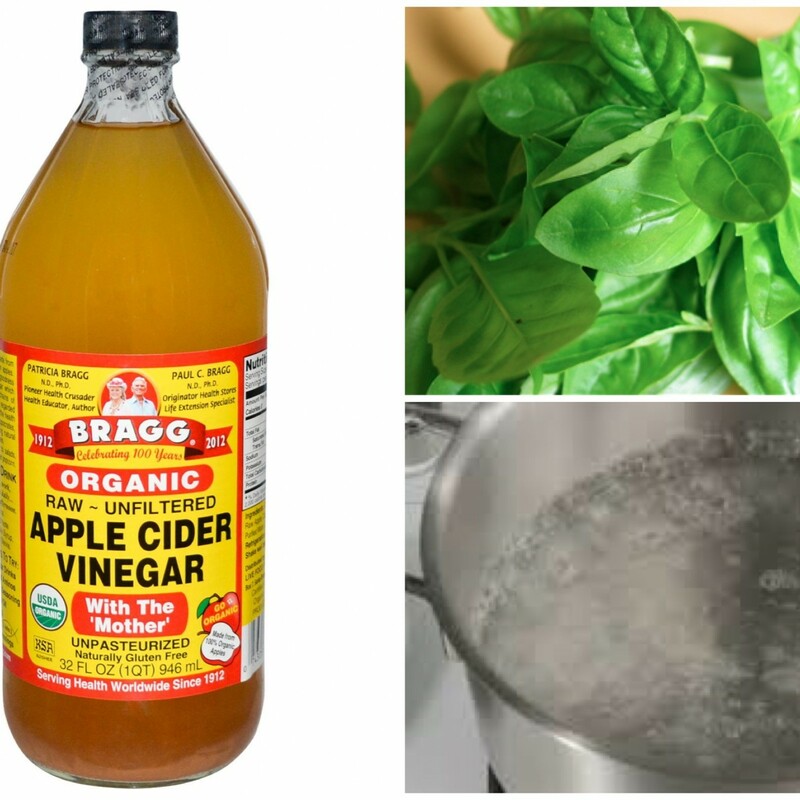 Try Bragg Apple Cider Vinegar. It contains everything you need. Oh, and did I mention that Scarlett Johansson is a fan of the ACV toner? And she’s got a pretty great complexion. While many of the ACV toners are simple a combination of Apple Cider Vinegar and distilled water, mine has a unique spin. I boil my water with basil leaves, then apply the basil water with the ACV. Why? Because ACV smells like dirty feet and this alleviates that awful scent, plus basil is awesome for problem skin too! You can add other ingredients like lavender, lemon (great for sun damage) and witch hazel into the toner too. It depends what skin concerns you are targeting. Basil – The oil aids in removing dark spots while the antibacterial properties help fight acne. The leaves also contain anti-aging and soothing elements (for an easy and effective DIY Basil Face Wash, click here). First begin by boiling the water, then drop in a handful of basil leaves. Allow to simmer for ten-fifteen minutes. Strain to remove excess basil fragments. For lavender, follow the same instructions. Apple Cider Vinegar on its own is too potent, so you must dilute with water (fresh or distilled). The more water you use, the less active the toner is. While dry and sensitive skin types will most certainly benefit from a daily swipe of ACV, you’ll want to use between 4 and 8 parts water to 1 part ACV. For oilier skin types, you can try between 2 and 4 parts water to 1 part ACV. *If you are adding witch hazel or lemon, do so now. A squeeze of lemon will do the trick. For witch hazel, use 1 part witch hazel to equal parts water. Mix your ACV and basil water in a bowl then pour into an old toner jar. Store in a cool, dry place and use morning and evening after washing your face. Follow with your moisturizer and SPF. *You can use the same batch for up to a month.